I met Lenora Bell at the 2014 RWA conference in San Antonio where she won the Golden Heart® for Best Historical manuscript. Not long after that, I had the opportunity to read the first chapter of what would eventually become her debut novel and I was captivated. I'm so excited to host her today as she celebrates the release of How The Duke Was Won. 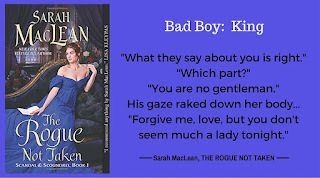 If you enjoy the books of Tessa Dare or Sarah MacLean, you won't want to miss How The Duke Was Won! In 2014 she won the Romance Writers of America's Golden Heart® Award for Best Historical. She’s thrilled to be debuting with Avon Books and hopes you enjoy spotting her very first bad boy at a bookstore near you. Please give Lenora a warm Romance Dish welcome! I have a thing for bad boys. You know the type. Motorcycles. Tattoos. James Dean t-shirt sleeves rolled over bulging biceps. But the 21st century didn’t invent bad boys. 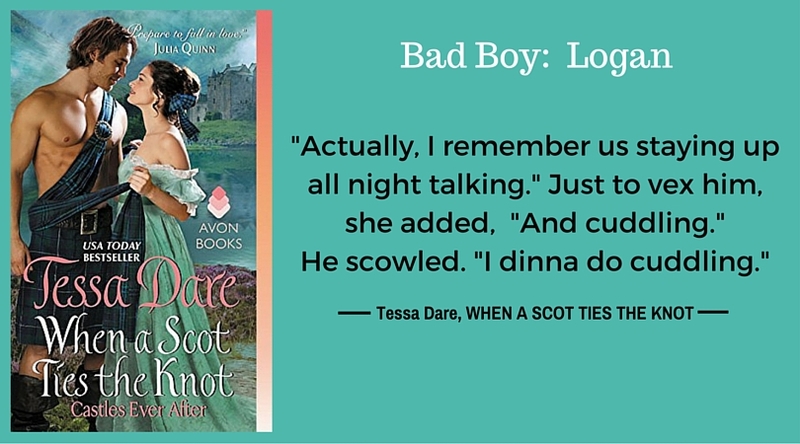 From the arrogant Darcy in Pride and Prejudice to the passionate Jamie in Outlander, I’m always searching for a wicked rogue in a cravat…or a kilt. So to help with the hunt, I’ve prepared a handy list for how to spot historical hotties. 1. Is his nose crooked from brawling in public houses? How about his linen shirt—is it still on? Bad boys rarely stay fully clothed for long. They’re always finding reasons to roll up their shirtsleeves, or plunge into lakes and emerge with wet, transparent linen clinging to rock-hard abs. 2. If you just met the guy and he calls you poppet, pet, love, or chit in a most infuriating manner...he’s an as-yet-untamed rogue. 3. Does he have a badass nickname like “Satanas” or “Devil Earl” or “Lord Beelzebub”? Hell yeah, he’s a bad boy. 4. Are your knees weak? Is your face flushed with heat? Do you feel a dangerous thrill? You may be in close contact with a bad boy. 5. If he’s prone to risqué innuendos and thinly veiled references to his endowments…he’s definitely a bad boy. 6. Is he always unbuttoning your gloves in public in a sensual, pearl by pearl, manner? Yep. He’s a bad boy. 7. Inventiveness is the hallmark of scoundrels. He won’t just kiss you. He’ll savor you. Slowly. In ways you haven’t even imagined yet. 8. You may have spotted a prime specimen if you discover a dark, painful past. Bonus points if he has trouble sleeping at night. More bonus points if he has literal scars from said dark past. Even more bonus points if looking at you gives him hope. 9. Warriors need love, too. They just don’t know it yet. An initial aversion to emotional intimacy is a sure sign you’ve found a bad boy. And the number one way to spot a historical bad boy? 10. When he falls, he falls hard. And it’s only your love that can save him. PJ is giving away two copies of HOW THE DUKE WAS WON (winner's choice of print or Kindle). and copies of four books featuring some of Lenora’s favorite historical bad boys: Tessa Dare’s WHEN A SCOT TIES THE KNOT, Eloisa James’ FOUR NIGHTS WITH THE DUKE, Beverly Jenkins’ DESTINY’S CAPTIVE, and Sarah MacLean’s THE ROGUE NOT TAKEN. Both giveaways are open internationally. Deadline to be included in giveaway is 11:00 PM (EST), April 27, 2016. 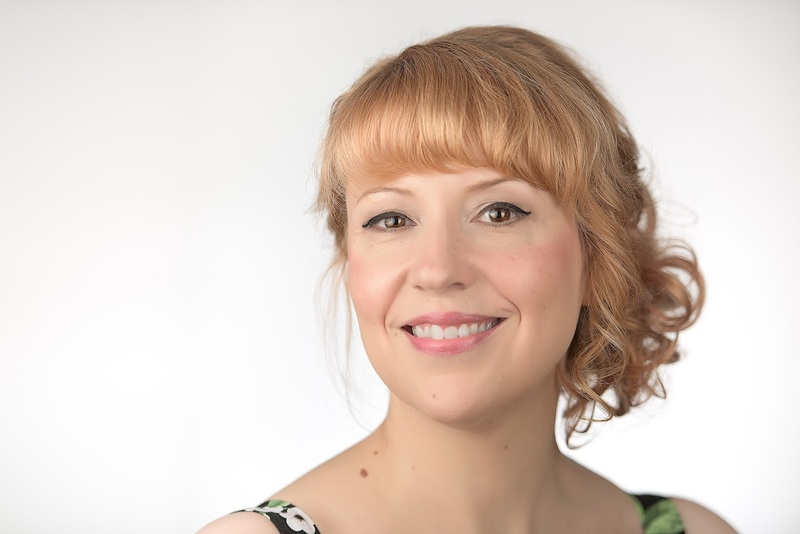 Welcome, Lenora! I am so excited that How the Duke Was Won has finally launched into the reading world. I can't wait for my friends to read it! I'll be back to dish about my favorite bad boys as soon as Rachel and I take our morning walk. Your James has a very special place on my list! There was one I really liked in one of LaVyrle's western historicals, but cannot remember the name of it. Maybe it was The Gambler. I love her books but I haven't read any of her westerns. I think I need to check them out. Well! Another new author! Thank you! Checking your books out right after I post this. I have a soft spot for Sebastian in Devil in Winter but lately my thorn in the side bad boy is Eloisa James, Thorne! Loved his character in Three Weeks with Lady X. Welcome Lenora! Right there with you, Hope. I adored Thorne! I think you're really going to love Lenora's James too. He's so delicious! 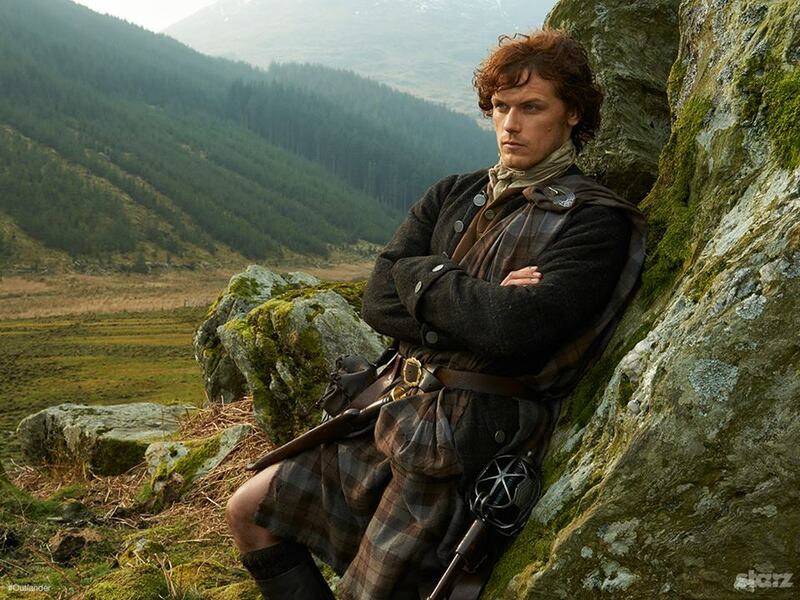 Jamie in Outlander. Why not. Edward Alcott in The Earl takes All is principled, and strong. 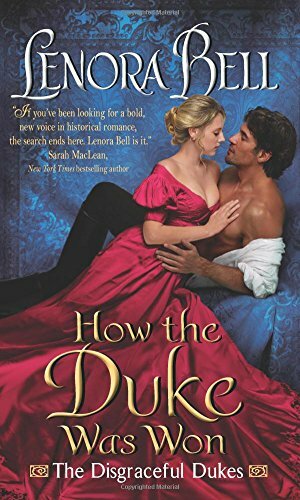 Congratulations on the release of How the Duke Was Won, Lenora. And what a delightful post! It was great fun reading it. One of my fav bad boys is Zachary Bronson in Where Dreams Begin by Lisa Kleypas. That man gets what he wants! I've been hearing such great things about How the Duke Was Won. I can't wait to read it. And I love lists! I'm addicted to beta heroes, but beginning with Heyer's Damorel, bad boys have also had a place in my heart. Other long-time favorites include Kleypas's Derek Craven, Putney's Reggie Davenport, and Loretta Chase's Vere Mallory, Duke of Ainswood, whom I adore almost as much as I do Dain. Lisa G. Brown's Billy Bob Walker and Nora Robert's Cameron Quinn and Rafe MacKade head my list of contemporary favorites. Janga, I forgot about Billy Bob Walker--that book has NEVER left my keeper shelf. That one and Crazy for Loving You--Phenom books and bad boys! Historicals have always and always will be my favorite type of read. At the moment I would say any of Grace Burrowes heroes!! Going old School - my favorite Historical Bad Boy of all time HAS to be James Malory from Johanna Lindsey's classic "Gentle Rogue"! Though King from "The Rogue Not Taken" swept my clean off my feet at the start of the year and I haven't regained my footing yet! The book won't be out until May 31st but I predict readers everywhere will be falling in love with bad boy, Rhys Winterborne in Marrying Winterborne by Lisa Kleypas. Rhys and Helen are right up there with Derek and Sara from Dreaming of You, Evie and Sebastian from Devil in Winter and Win and Kev from Seduce Me at Sunrise in my "Favorite Lisa Kleypas Couples" hall of fame. Now you're just taunting us, PJ! ;) I love Lisa Kleypas!! Sorry, Lenora. I'm just so darn excited about this book! I wasn't crazy about the first book in the series. I couldn't warm up to the heroine (still can't) but oh, the love I have for Helen and Rhys. This is vintage Kleypas! PJ, I think a lot of readers shared your response to the first book. I thought the best thing about that book was the secondary characters. :) I have been impatiently awaiting Winterborne's book. alysap ay yahoo dot is the correct eaddy. Sebastian is such a delicious hero, isn't he? Be sure to mark your calendar for May 31st. Rhys Winterborne (in Kleypas' next book) will steal your heart! Lenora, can you tell us anything about the next book in your Disgraceful Dukes series? When will it be released? Any clues about the story that you're at liberty to share? Another gorgeous cover and - OMG - love that blurb! I'm so ready for Thea and Dalton! I'm too excited to sleep! This was so much fun! Congratulations Lenora on your new book. Can't wait to read it. Everyone is raving. Bad boy heroes, love several of yours including Vander, King and Logan. Also agree with PJ about Rhys Winterborne, he's Welsh, need we say more. My newest bad boy is Edward Alcott in Lorraine Heath's newest the Earl Takes All. I haven't read Heath's newest yet. One more book on my ever-growing tbr mountain! Congratulations on your release day! I’m always excited when new historical authors arrive on the scene. 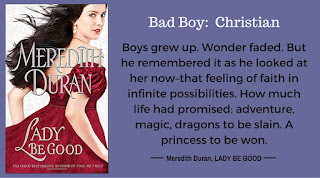 One of my favorite recent bad boys is Meredith Duran’s Nick O’Shea, in Luck Be a Lady. Luck Be a Lady is waiting for me. I love Duran's writing! Congratulations on your debut book. I have to agree with the other commenters that said Lisa Kleypas writes great heroes. Nick O'Shea, in Meredith Duran's latest historical, Luck Be a Lady, was a terrific bad boy hero. He was a crime lord in Whitechapel that met a woman that runs an auction house. And another vote for Nick O'Shea. I'm thinking I may have to move this one up my reading list. Oh yeah, PJ. I love all of Meredith's books! She writes the brooding, wounded bad boy like no one else! I'm a huge fan. Like you, I discovered her with the release of Duke of Shadows. She blew me away! Hi, I'm a big Pride and Prejudice fan so Mr Darcy is my ultimate bad boy pick! Mr. Darcy is always appropriate, Amanda! I agree! He's the one who started it all for me, too! Glad to hear you're still enjoying the prize you won last time Lenora was here. Hope you enjoy the book too! Well hello, Crystal! So glad you still enjoy the prize. PJ has been so supportive and encouraging. So blessed to be back on the Dish! Elizabeth Hoyt writes the most delicious historical bad boys! Any from her stable of heroes would do. Congrats on the release! Yes, she does! I adored Asa Makepeace in Sweetest Scoundrel. Oooh I love Elizabeth Hoyt! I got to meet her at RWA14 and I fangirled out let me tell you! I've always loved Dain and Bourne. Dain is the ultimate bad boy! That lamppost kissing scene. I think I have it memorized! I have to admit, the first ones who came to my mind were Dain, from Lord of Scoundrels, and Rhett Butler, from GWTW. I enjoyed your post and look forward to reading your novel, which is already on my TBR list. Two more good choices. I always liked Rhett. And thought he deserved much better than Scarlett! Another vote for Dain! PJ, I think we have a clear bad boy winner ;) The Bane & Blight of the Ballisters himself! Is it possible to have all ten rolled into one? Is that asking too much? I don't think so! I'm really looking forward to reading your new novel, Lenora, and may I add that you are a pretty lady. Not trying to sway you, just being honest! Congratulations! My favorite is Dain from Lord of Scoundreles,also Tor from The Chief and Alec Kincaid from The Bride. I have to say that I loved Christopher Argent in Kerrigan Byrne's latest book "The Hunter". It has everything you could ever wish for, danger, passion, romance, and a dashing, tormented assassin. I was gripped from page 1 right up until the end. The blatant sexual chemistry between Christopher and Millie was sizzling. There's a serial killer on the loose out to get Millie and her son. I gave this book 5 stars after reading it. It's a stand alone book, but Dorian Blackwell from Kerrigan's first book (The Hunter) does make an appearance from time to time. These two guy are bad arse bad when working together!! Thank you Lenora. I'm not a professional reviewer, just a hopeless addict of historical romance. I'm going to check out your book which sounds wonderful, and I love finding new Authors. I have this one on my Kindle, Diane. I think it needs to be moved to the top of the reading list! PJ, you definitely need to move this one to the top of your reading list. I told my sister about it, and she bought it. This sounds like a fun romance! I love your list, too. 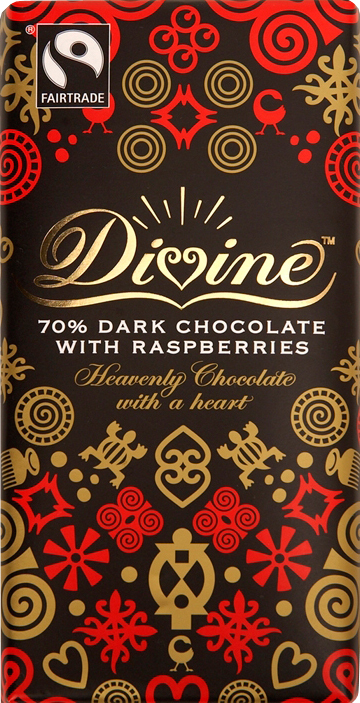 Of the ones you listed, Dain has been a longtime favorite. Congrats on the new release!!! Definitely going on my want list ;) I'd have to go with Christopher Argent from Kerrigan Byrne's The Hunter. Yum!! Thanks for sharing! so many to choose from -- they are all so yummy. but one of my fave's is Johanna Bourne's Adrian/Hawker from Black Hawk and the related books in the series. I haven't read any of those bad boy's stories yet but now I have them on a special TBR list. Some of the first historical Bad Boys I read about where the Cynsters. 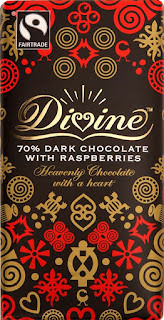 Hi Di! Thanks for commenting and I'm honored that you want to read these books now. You should really start with Lord of Scoundrels by Loretta Chase. Such a classic!! Dear Lord, Lenora, you put into words all the things I love about a bad boys! All the things I felt but I never knew how to put into words. Thank you! Voss from Dark Rogue (The Vampire Voss) by Colleen Gleason is one of my favorite bad boys. Hi PJ & LENORA! I'm so sorry that I missed you at RWA/SAN ANTONIO. We couldn't make it that year, but if you're attending RWA/SAN DIEGO This summer we'd love to get together with you. Ask PJ, she'll tell you we're okay. Anyway, I'd love to read your new book; it sounds just wonderful. I, too, adore Bad Boys. You give some fine examples. I will add Lisa Kleypas' Devil in Winter, Sebastian Saint James to the list. I'll take Jamie Fraser thank you. A man in a kilt is something extra special. I like Alexandra Hawkins Lords of Vice: Sin, Dare, Frost, Hunter, Vane, Saint and Reign. Oh wow - now THAT is a list of great rogue names! Thanks for stopping by, Laurie! I'm so glad to meet you Lenora. I'm looking forward to reading yourHow The Duke Was Won. Jamie Fraser of course and Devil Cynster from Stephanie Laurens Cynster family series. And to be honest every Highlander I've ever read bout. lol. Sorry, these bad boys are so beautifully overwhelming. Hi, Lenora! Congrats on your new release! There are a lot of bad boys I have loved over the many yeats of reading, but Rhett Butler from Gone With the Wind and Steve from Rosemary Rogers Sweet Savage Love series sticks out in my mind. Of course, I also love Jamie Fraser. ::Sigh:: Jamie. So much love. Nice! Sweet Savage Love is classic bad boy. And Jamie. Be still my fluttering heart! I am so loving this post!! Hello, Lenora!! Nice to meet you. I have a copy of this book on my nightstand right now...I just haven't gotten to it yet, but since you speak my language (BAD BOYS) I'm clearly going to have to hurry up and finish the current book and move to this one! 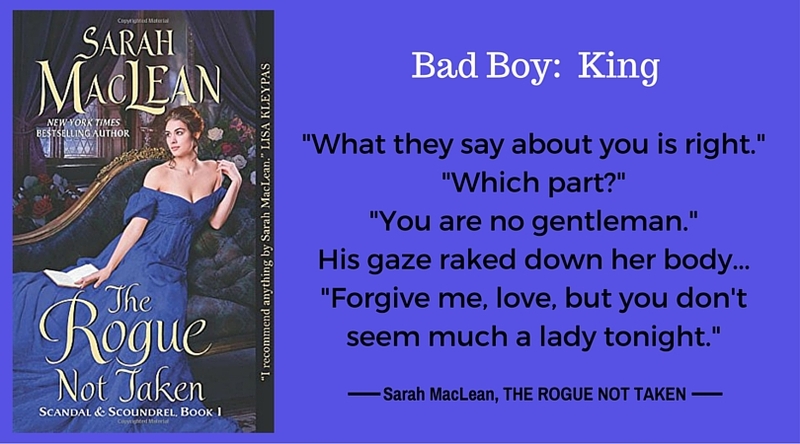 What fun to read the way to recognize a bad boy! My choices echo some already mentioned: Dain from Scoundrel, Sebastien from Devil in Winter, Derek Craven, Vander from Four Nights, and what about Tack from Motorcycle Man? Obviously, the bad boy really appeals to me.